These titles themselves illustrate the problems that have beset Leapfrog and as the heading of this article already tells you, these are in my opinion far from over. To understand what has happened to the company, we have to go back to the beginning. To quote the Great Idea Finder: “The idea for Leapfrog and its Phonics Learning System evolved from an impromptu parent-child learning session in a living room floor. Michael Wood, the father – an attorney specialized in high technology law – was trying to teach his 2 ½ year old son that the letters in his wooden alphabet puzzle make phonetic sounds which can be combined to form words. When he was unable to find anything on the market which associated letters with the phonetic sounds they make, he began the process of creating a product that would help to read through phonics.” And so the company was founded in 1994. From the onset, Mike’s philosophy was that Leapfrog products were educational devices masquerading as toys and not the other way around. He understood that mothers would be willing to pay a premium for any product that credibly promised their little guys a head start in life. So he embarked upon a three-pronged effort – he put the products into retail and advertised them as educational aids to the parents, he invested in formal research to prove that Leapfrog products in fact did what they promised, and he closely worked with schools to recruit the teachers to his cause, and through them, the kids themselves. And things went very well for ten years. Leapfrog’s one real competitor, VTech’s VSmile, was kept at bay and the three-pronged formula worked like a charm. Also, Mike Wood was wise enough to bring a professional manager, Tom Kalinske, into the company in 1997 to ensure that the nuts and bolts of the business were properly looked after. 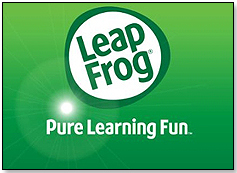 Sales grew rapidly, Leapfrog went public in 2002, and sales hit $680 million worldwide in 2003. Then in 2004 the company had a setback and sales fell to a still very respectable $640 million. 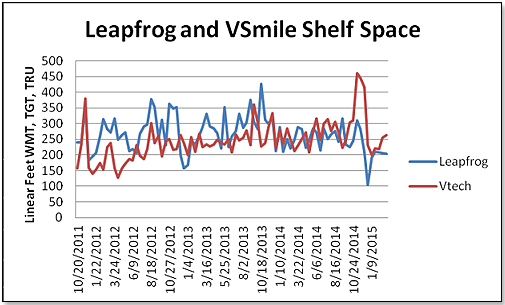 Three reasons were thought be mainly responsible for this drop in product shipments – one was the launch of VTech’s VSmile Learning System that year; the other a sharp tightening of inventory management practices by the major retailers and the third supply chain issues associated with a new distribution centre. Whatever the cause was, the Board of Directors, egged on by the major shareholder, Mike Milken, hit the panic button. They did two things – both, in retrospect, major mistakes. One was to demote Mike Wood and then to force him out of the company altogether. In many ways, it was Steve Jobs’ ouster at Apple all over again with one difference – Steve Jobs came back to rescue his company. Mike Wood did not. The other mistake was to bring in Jeffrey Katz in 2005, first as board member and then as CEO. Mr Katz had had a somewhat chequered career up to then and its high point had been his stint at Swissair, first as President and then as CEO, from 1997 to his very abrupt departure in 2000. Swissair, Switzerland’s flag carrier, went bankrupt shortly afterward. 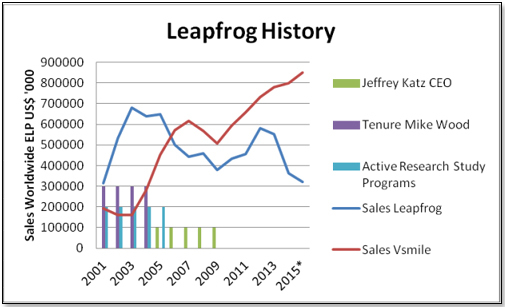 In any event, Mr Katz immediately took steps at Leapfrog to cut costs and thus effectively chopped off two of the three pillars underpinning the company – he discontinued in 2006 all formal research designed to give substance to the company’s educational claims and then, in 2008, he shut down the “School Segment” designed to develop, design and market electronic educational hardware products and related software, sold primarily to school systems in the United States. “Historically, we operated a School segment that sold products tailored for the United States educational market directly to schools, teacher supply stores and through catalogs and websites aimed at educators. After several years of extensive investments in direct sales and in research and development, our School segment experienced continuing sales declines, which accelerated in 2008. We believe this was primarily due to industry consolidation and severe funding constraints that limited the availability of school funds for the supplemental category of products that LeapFrog School marketed. I do not believe that Mike Wood instituted the “School” program to make money but rather as a marketing tool to lend credence to the company’s educational claims just as was the case with the formal research programs carried out during his tenure. In any event, things did not turn out too well and Mr. Katz left the company early 2010. Leapfrog beat VTech, its main competitor, all hollow until Mike Wood departed and then the picture reversed itself, and has stayed that way. So, what is the secret of VTech’s success? One is stability. Its chairman, Allen Wong Chi Yun, co-founded the company in 1976 and has been its CEO ever since then. Its President. King Fai Pang, joined the company eleven years ago. The second significant attribute is depth of technological expertise – VTech is a leading manufacturer of cordless phones in addition to being the premier electronic learning product company. As a result, VTech tends not to have the technical glitches which attend many of Leapfrog’s new introductions and which bedevilled for example its Ultra launch. The third and possibly the most important is its continuous stream of education-oriented research reports on VSmile products written by leading and independent experts from top universities and distributed amongst the educational profession. These reports are also on VSmile’s website and readily accessible by parents. 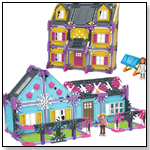 What VTech gets, and Leapfrog apparently does not, is that mothers do not buy these expensive electronic learning products because they need to put something, anything, under a Christmas tree. 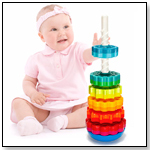 They do not buy them as toys; if they did, they would have many much less expensive alternatives. They buy them because they want the best for their children’s early education and to give them a head start in life. They need to be reassured that they are making the right choices and this reassurance does not come from advertising but rather from recommendations from people the mothers trust – like educators. Mike Wood got this but he appears to be the last one at Leapfrog to have done so.